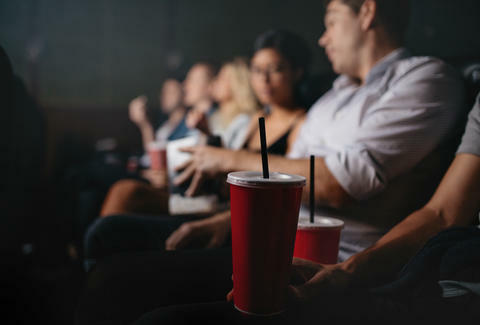 When all is said and done, and popcorn and soda have been purchased, a trip to the movies can easily set you back over $20. But MoviePass, an app that offers daily access to movies for a monthly subscription, thinks you should be shelling out a hell of a lot less than that. And in an attempt to woo prospective members, the service just announced a special promotion that essentially reduces its monthly fee to the lowest its ever been. The service, which is run by one of the co-founders of Netflix, made headlines earlier this year when it slashed its subscription price from $30 to $10. Now, it's doubling down by offering an $89.95 annual membership fee, which amounts to paying roughly $7 per month. That means you could theoretically pay the same price to go see a new release movie in theaters every single day of the year as you would to subscribe to the most basic Netflix streaming plan. If you're unfamiliar with the service, it works like this: once you've signed up and paid the fee you'll be sent a special MoviePass card in the mail, which you'll use as a debit card to make ticket purchases going forward. Then you're in the clear to swipe and see practically any movie you want (except 3D/4D or IMAX screenings) without forking over a dime -- at any theater where it's accepted, which is 91% of 'em in the United States at this point. Depending on the theater you plan to visit, you may also be able to purchase a ticket ahead of time, though for the most part it can only be used for same-day tickets. For commitment-phobes (gamophobes) not ready to pony up $89.95 all at once, there's still the option to pay 9.95 per month for the same service. However, in a press release the company claims this annual price promotion will only be available for a limited time, so you may miss out if you wait too long.